To make the base, drain medjools, place all ingredients into a food processor and blend until well combined and ingredients are sticking together. Press base mixture into a lined 20cm spring form cake tin and set aside. To make the filling drain cashews, process all ingredients in a food processor except coconut oil, and process until well combined. Keep the food processor on and slowly pour in coconut oil - process until smooth and creamy. Pour cheesecake filling over base and place into the freezer for at least 30 minutes. Melt the chocolate gently in a pot on the stove top and drizzle over the top of the berry sauce. Sprinkle over coconut cacao nibs. 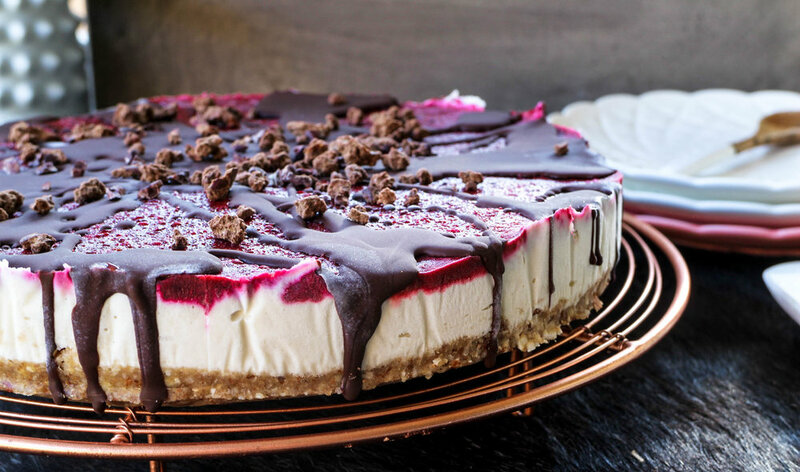 Place cheesecake into the fridge for at least 4 hours to set. Today is our blogs 3rd Birthday! 3 whole years since we started on this crazy journey of sharing recipes with you! We did not start our blog with any intention of being where we are today - meeting all of the amazing and incredible people we have, working with brands we have been fans of for years, signing a book deal with the biggest publishing house in the world (still blows our mind), getting to travel to dream destinations or running our own cooking workshops and have people turn up! None of that ever crossed our minds but we are so happy it has and feel greatful every single day to be able to do what we do! So thank you for coming along on this ride with us. To celebrate our 3rd Birthday I decided that I would share one of my favorite cake recipes on the blog. When I made this cake yesterday I wanted it to be super special and a little bit different from how I normally make it, so for me that was adding on chocolate, of course. After the cake had set and I had a bite the first thing that came to my mind was "wow, this tastes like a Jelly Tip". 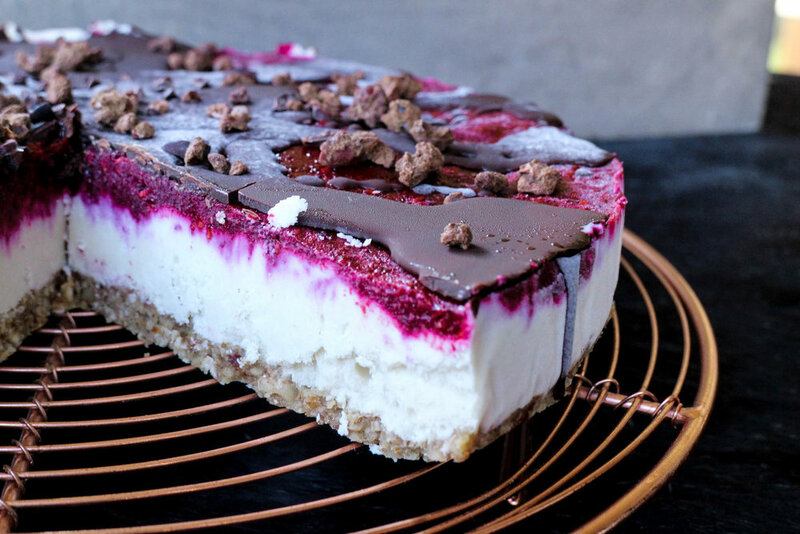 An ice cream like layer, berries and chocolate. So delicious, yet so guilt free. As it is not Summer yet I have used frozen berries and all the nuts I use are bulk purchased from Alisons Pantry (cost saving method!). 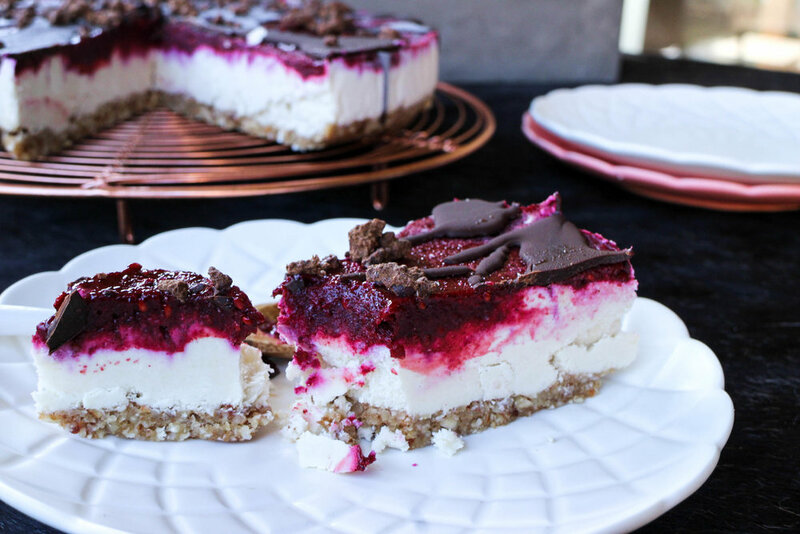 If you are vegan, dairy free, refined sugar free, gluten free or LCHF this recipe will fit in with your dietary requirements. 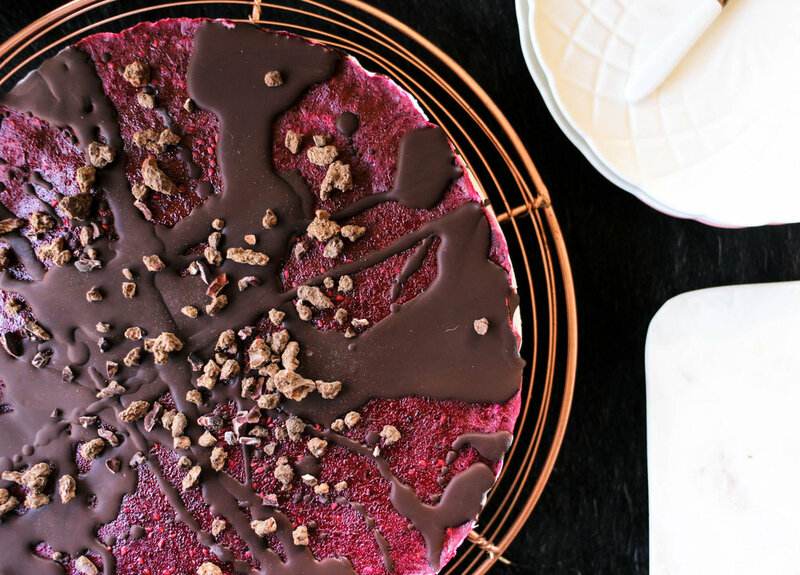 This cake truly is delicious and very filling, please try and let me know what you think.